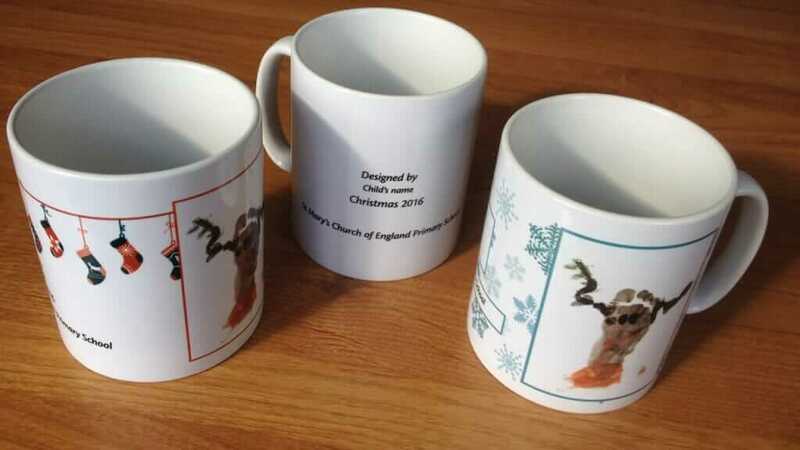 In response to feedback on our mugs at Christmas 2015 we have made some substantial changes to our range of mugs for 2016. In fact, the offer is hardly recognisable and we think represents the best offer on the market for 2016. So what’s different? Each school will be able to choose from one of three distinctive designs that incorporates the child’s design, name and school name. Our mugs will all be packaged into top quality rigid postal boxes to ensure they arrive in school in perfect condition. Our mugs are all coated with the industry standard “Orca Coating”, which is proven to be dishwasher safe. Our mugs are printed in-house. We have invested heavily in creating an in-house production facility where we can control quality to our total satisfaction. Your mugs will be delivered in the same shipment as your cards, thank you cards and gift tags. This makes distribution easier in school and prevents waiting for secondary parcels to arrive. To see the new designs in all their glory and to find out more about the packaging (including how we tested it’s robustness) you can watch our YouTube video. Return to information about our Christmas cards for schools project, or register today for our Christmas project.